Proud to be a geek? Show it by purchasing one of our original geeky T-Shirts. The best selection of official merchandise T-Shirts from your favourite series, videogames and movies! If you are looking for a nerdy gift you are in the right place. At Funidelia you will find a great variety of nerdy shirts in all different styles for you or to give as a present to whoever you want to. Shirts and videogames from music groups, shirts from your favourite films or TV series...a load of super original models! From Star Wars or Rick & Morty shirts, Harry Potter to Game of Thrones. 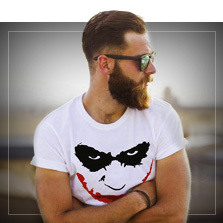 Super hero T-Shirts such as Batman, Superman, Wonder Woman or Captain America. 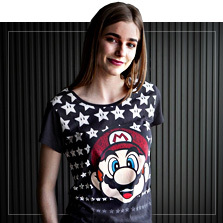 There are also shirts from your favourite videogames: Nintendo, Mario Bros, Zelda, Pokemon, Playstation or God of War... Choose the geek T-Shirt style you like the most and show it off with pride for being the number one fan! Includes: T-Shirt with 3/4 length sleeves with the Gryffindor symbol. If you are proud of your geeky side, if you have a super nerdy friend and you want to give him a gift... there is nothing better than grabbing one of our geeky T-Shirts. 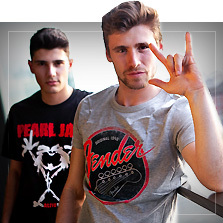 All the themes you can imagine so that you choose the merchandise T-Shirt you like the most! 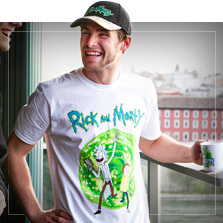 A large variety of original and fun T-Shirts for those who are fans of Rick & Morty, Harry Potter or Star Wars. Many characters, quotes and even logos from your favourite videogames and series. Geeky T-Shirts for women and for men, many styles for you to choose your favourite and show everyone you are a geek... and proud!